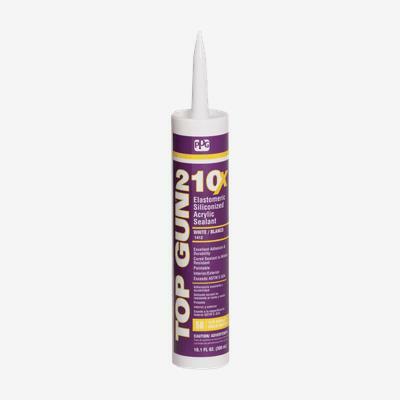 TOP GUN® 210X Elastomeric Acrylic Sealant is a premium grade sealant that forms a durable, flexible, airtight, weather resistant seal that offers exceptional protection from environmental conditions. TOP GUN 210X flows smoothly, is easy to apply, offers good paintability and resists rust bleed-through. Where applicable, remove old sealant or caulking. Thoroughly dry the joints or surfaces, where the TOP GUN 210X will be applied. Remove all dirt, dust, oil, mildew, loose paint or other contaminants. Bare surfaces should be primed before caulking.